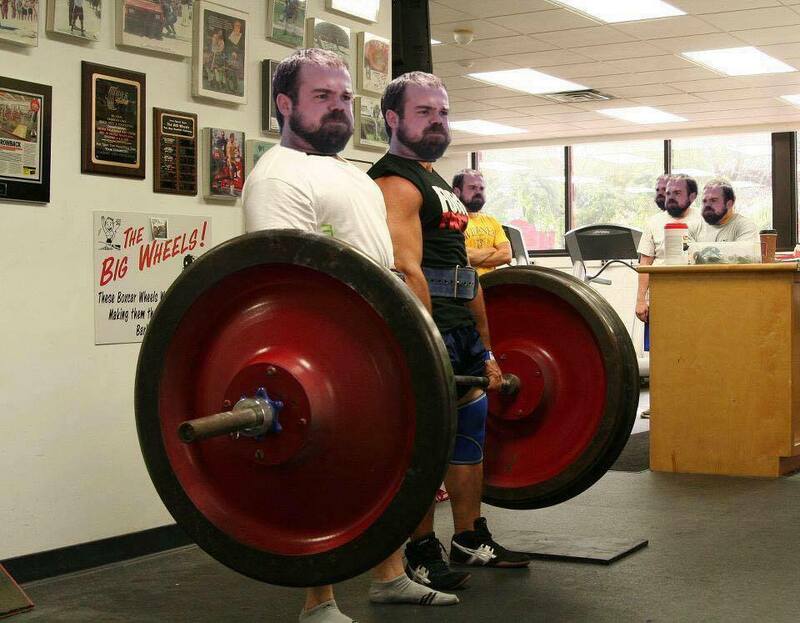 OG commenter Sousa recently got a new smoker, and has dove into the world of BBQ headfirst. Here’s the first of a potential series from him on smoking various meats. Hey there, it’s been a minute since the last 70’s Big post and I thought I’d throw my hat in the ring. Some of you 70’s Big veterans may recall Gant had a post on smoking brisket some time ago, and that post was one of the early seeds that planted the desire in my heart to begin smoking meat. 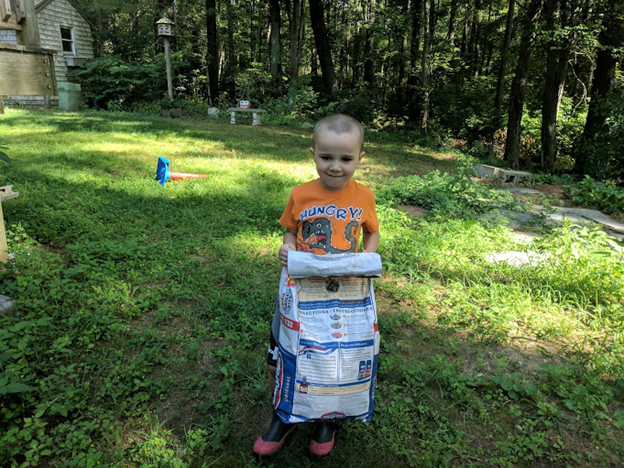 Well, it took several years, but I am finally beginning on my journey into the smoke filled world of barbecue and I would like to share some of my adventures with you. First, let me discuss what I am cooking in. Stepping foot into the arena of smoke can be daunting as there are numerous options (and of course opinions on those options). Wood, pellet, charcoal, offset, reverse flow, bullet, drum, enormous green eggs, etc. ; so many things to consider you may want to not even bother. I’m not going to go into all of those things here, but I will walk you through how I decided on my first cooker. The biggest factor that played into my decision was time. Right now I have four kids ages 7, 5, 3, and 1. As a result time, especially sleeping time, is a precious commodity in my life. 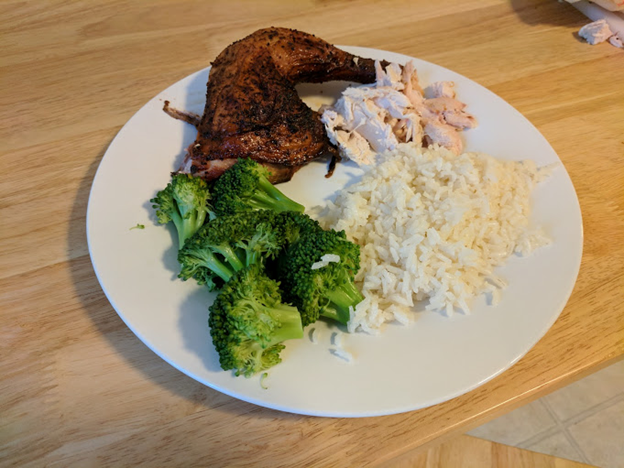 While I plan to eventually own a smoker that has more traditional long cook times, the idea of something that can produce good results in less time appealed to me. Next, I am a total noob with zero guidance beyond reading posts like Gant’s and watching YouTube videos, so something with less of a learning curve seemed like a good thing. Finally, capacity was important as I wanted to be able to cook a decent amount of food at once. With all of these combined I was able to start filtering my choices. 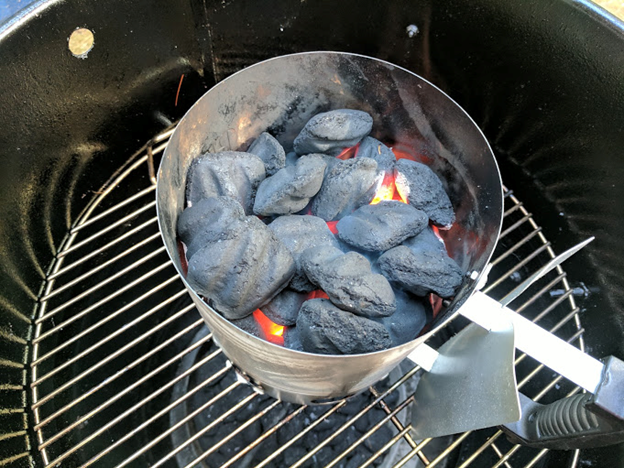 I finally came across something that seemed to fit the bill perfectly – the Pit Barrel Cooker (hereon referred to as PBC). *The PBC can cook for about 8 hours on a single basket of coals which is pretty efficient. 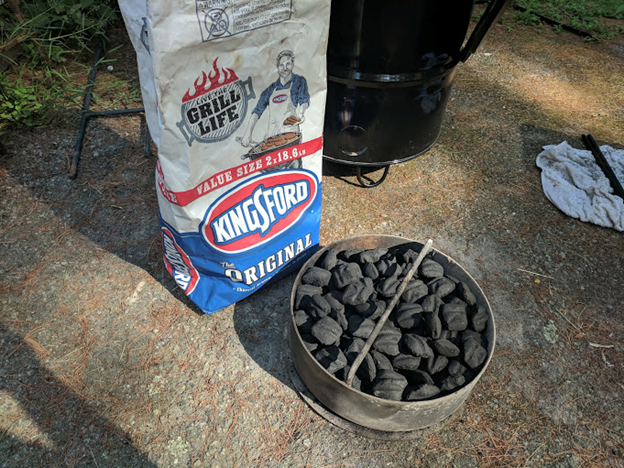 However, if you only want to smoke something that takes a couple of hours there is no out-of-the-box way to snuff the coals which means you use a whole basket for a two hour cook. **The manufacturer basically suggests you only use charcoal, however you can find people on forums, etc. that have done cooks with wood chunks with good results. I know this is starting to become a PBC infomercial so I’ll stop discussing it’s attributes and get into cooking with it. I’m going to cover getting the coals lit in case that is helpful to anyone reading. Have your assistant get the bag of coals; having a good assistant is key. The first thing I do is fill the coal basket so it is about level with the sides, and then take about 40 pieces from the basket to fill my chimney starter. I then put the basket into the barrel, and then the grate as well. 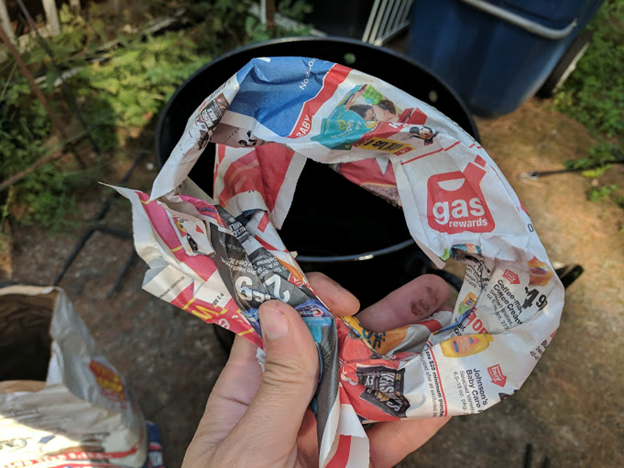 Now I take a couple pieces of newspaper and roll them up and then wrap them into circles that will fit into the bottom of the starter. I do this instead of just crumpling them as I feel it does a better job of not restricting airflow as the paper is burning and heating the coals. I sit the chimney on the grate in the barrel, light the newspaper, and let it heat up for about 12 minutes before dumping the hot coals back into the basket. 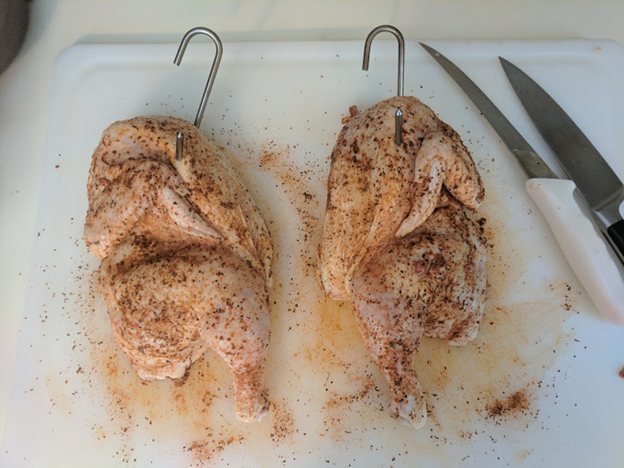 Now that the coals are going I am ready to hang my chicken halves. Before lighting the coals I prepped the chicken by halving it (cut the spine out completely). 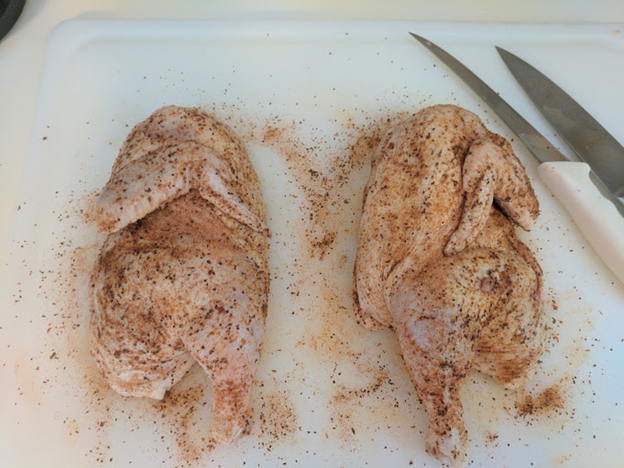 Then I put a generous amount of rub all over both halves making sure to get it under the wings and thighs, as well as on the inside of the bird. Once the rub has been applied I grab a couple of the hooks that came with the PBC and insert them in the meatiest area of each breast. That’s all there is to it, and now they can hang. A couple tools I picked up that have helped me a ton with getting good results are these thermometers. The black unit with the wired probes allows me to monitor the cooking temp inside the barrel as well as the internal temp in whatever meat I’m cooking. 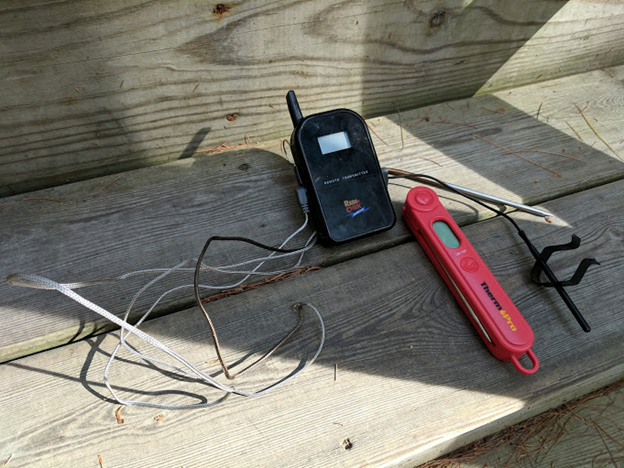 The red dealy is an instant read thermometer I use to double check the internal temp once the probe tells me it’s where I want it. Some stuff doesn’t really need a thermometer (i.e. ribs), but other stuff it helps tremendously as you may need to take certain steps like wrapping at specific temperatures (i.e. brisket and pork shoulder). Once the halves are hung, and I’ve got my thermometer set up, it’s basically time to just let it do its thing for a couple of hours. I’ve cooked several birds at this point and it’s been very consistent in cook times and results. 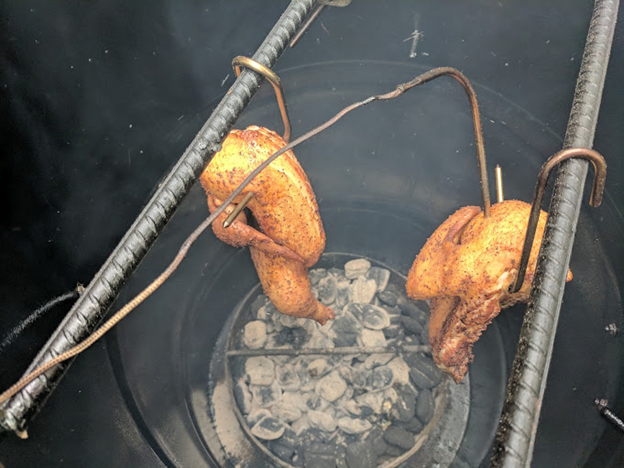 In terms of the capacity I mentioned earlier you can fit eight chicken halves in the barrel, and since the coals can easily last 6+ hours you could do three cooks on a single basket of coals. Twelve smoked chickens in 6 or so hours with minimal effort seems like a good deal for any meal preppers out there. If this write up didn’t bore the crap out of you, and you’d be interested in future posts (that wouldn’t include the PBC commercial), drop a note in the comments. Thanks all!